I love my squats, and so in turn I pretty much love any variation of the squat as well. 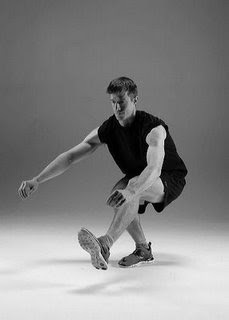 Single leg squats are great, and you'll feel them even if you don't hold any sort of weight which means they are a great one to do at home if needed. Stand on one leg, and get your balance, tightening those abs. Keeping that knee in the same place sit your hips back into a squat. Your goal is to have this look like a regular squat, just on one leg. Try not to allow those knees to shift forward. You'll feel them more in your glutes if your hips are back. Try to go down as low as you can, keeping that balance and straighten back up. Keep that foot up the whole time. Do 12-15 reps on each leg. Happy squatting!